The safeguarding of cultural heritage is grounded in contemporary socio-economic relevance. African Heritage can assist in demonstrating and developing this relevance. A key factor in this relevance is local and international tourism. Tourism demonstrates cultural significance and generates revenue. African Heritage can develop cultural tourism plans, assist in implementation and develop marketing strategies. 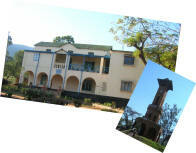 For interested groups our staff is available as expert guides for cultural and heritage tours in Malawi.